This custom-designed Single-Channel EMAT system can be employed for PC-aided manual and/or automated ultrasonic testing using linear polarized shear waves. 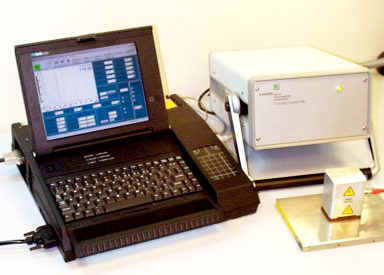 In combination with suitable software running on DOS©, Windows© 3.1* Windows©95/98/ME, or Windows© NT platform, a complete digital EMAT testing system is available for a wide range of applications. The system consists of the EMAT Front-End (type P3109), a Synthesizer/Burst-Generator (type SEB_SYN), a preamplifier, the PCUS 11 Pulser Receiver and A/D Converter board, and a suitable permanent-magnet EMAT search unit. This custom-designed EMAT transducer delivers 1.3 MHz linear polarized shear waves at normal (0°) incidence. The size of the active sound field in the material is 20mm x 20mm. Air-cooling (forced air) permits continuous operation at temperatures not to exceed 500°F (250°C). The search unit was designed for the inspection of heavy-wall stainless steel components, such as forgings, piping, flanges, etc., at elevated temperatures. A variety of system configurations for single-channel manual and/or automated inspections are available. To meet your specific configuration requirements, several different PC enclosures are available, such as Laptop, Lunchbox, or Desktop designs as well as processor options ranging from a 486DX4-66 to a Pentium 166. In addition, a multitude of display, hard drive and miscellaneous options (e.g., integrated CD-ROM, PCMCIA card reader, etc.) are available for complete customization of your system.